Heat oven to 350°F (325°F for dark or nonstick pans). Place paper baking cup in each of 24 regular-size muffin cups. Make, bake and cool cupcakes as directed on box. Carefully pull back a small section of paper from each cupcake; insert marshmallow half between paper and cake of each. 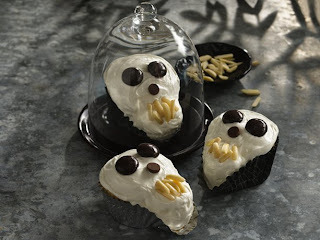 Frost tops of cupcakes and marshmallows to look like skull shape. These cupcakes can be made several days ahead and frozen. You can freeze them before or after decorating. Look for Halloween-themed paper baking cups in the baking aisle at your local craft store. 1 Serving (1 Cupcake)Calories 270(Calories from Fat 80),Total Fat 9g(Saturated Fat 3g,Trans Fat 1g),Cholesterol 0mg;Sodium 160mg;Total Carbohydrate 45g(Dietary Fiber 0g,Sugars 34g),Protein 2g;Percent Daily Value*:Exchanges:1 Starch;0 Fruit;2 Other Carbohydrate;0 Skim Milk;0 Low-Fat Milk;0 Milk;0 Vegetable;0 Very Lean Meat;0 Lean Meat;0 High-Fat Meat;1 1/2 Fat;Carbohydrate Choices:3;*Percent Daily Values are based on a 2,000 calorie diet.